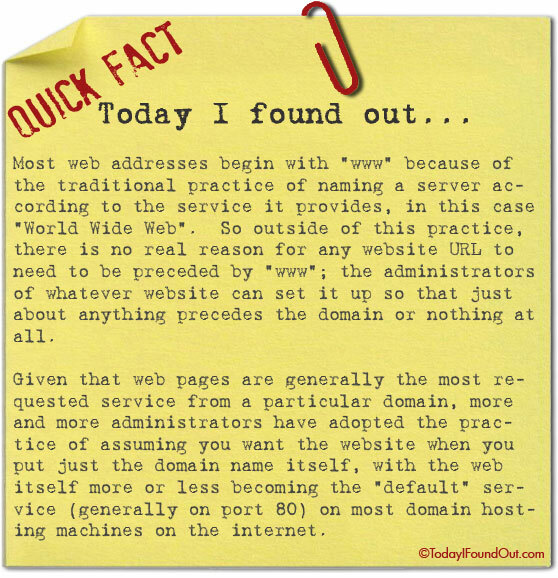 Why Many Website Addresses Begin with "www"
Most web addresses begin with “www” because of the traditional practice of naming a server according to the service it provides, in this case “World Wide Web”. So outside of this practice, there is no real reason for any website URL to need to be preceded by “www”; the administrators of whatever website can set it up so that just about anything precedes the domain or nothing at all. Given that web pages are generally the most requested service from a particular domain, more and more administrators have adopted the practice of assuming you want the website when you put just the domain name itself, with the web itself more or less becoming the “default” service (generally on port 80) on most domain hosting machines on the internet.